What’s the most important – Blog? Newsletter? Social media? You’re doing all. the. things. to share your expertise online and build your subscriber and client lists. It can be overwhelming if you don’t always know what to focus on first and how to make them all work together. What’s the most important – Blog? Newsletter? Social media? You absolutely can have your blog, newsletter, and social media work together to make a comprehensive content strategy. In fact, you should! And there is a logical sequence to use to make this all a smooth and easy process. Here’s how I do it simply as one cohesive content marketing strategy that works. Ideally, you want to attract ideal clients from all over the internet. Right? So, you need all three. But, they each serve slightly different purposes and the audiences are slightly different. They can all have the same foundation while being slightly tweaked for the audiences they’re meant for. Social media attracts new people and gets your followers to check you out – it lets more people get to know you. Your blog impresses them and helps them to like you enough to give you their email address. Your newsletter nurtures your relationship with them to build their trust. Some will eventually purchase your products or programs to help them reach their health goals. Here’s the thing – even though social media is often the first place people find you, it’s not the first place you should create your content. All three arms of content marketing are important, and one of them is the logical foundation for content the other two. Your blog is like your online business card. It’s the “home” for your intellectual property (don’t build your business on someon else’s platform!). It showcases your niche and expertise, and helps people see you as someone who can help them. It should also help people to like you enough to give you their email address and sign up for your newsletter. When you have a blog post published you now have foundational content for the other two. Pull images, excerpts, and quotes from it for your social media campaigns (along with other interesting and entertaing social shares). If you start your content creation with a blog post, you can then use that as a basis for both your newsletter and your social media! 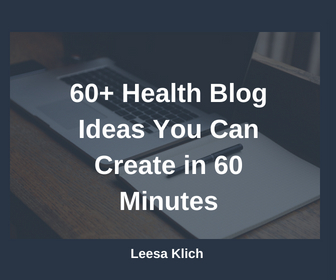 If you want dozens of ideas what to blog about here are a bunch for wellness blogs, and when you have lots of ideas, here’s how to choose the one to publish next. Once you have a great blog post, the newsletter and social media flow so. much. easier! That’s been the online marketing mantra for years now, right? Social media is incredibly overrated. Use your email to build a sense of community. Don’t let a $100 billion company get between you and your customers. People who have already opted into your newsletter already know and like you. They’re no longer random people on the internet, they are your inner circle. They’re your community. This means they get a more personal touch and extra bonuses that your blog readers and social media followers simply don’t get. Your email subscribers should definitely get a link to your latest and greatest blog post, but with a more personal introduction. They should also get subscriber’s only bonuses like the opt-in freebie they requested, maybe some tips or a personal story you didn’t share on your blog. Even announcements and special offers before they’re public. Personal intro to this week’s blog post (not just the blog intro, but something more personal). Link to this week’s blog post. Invitation to reply to the email to contact me personally. Subscriber-first info (e.g. new offers, flash sales, announcements, etc.). P.S. with links to a few ways I can help them, including my library of opt-in freebies for them. Thanks for being a subscriber and a tad bit about me. I make sure my weekly newsletter is filled with value from my blog post and subscriber-only tips. I show my subscribers how much I appreciate them. I also include a few promos for when they’re ready to work with me. It’s also not a one-way street. I welcome and encourage my subscribers to contact me if they need help with anything related to health research, blogging, or content strategy. This is how my blog is the foundation for my newsletter. On top of my weekly newsletters, I also send a few additional emails throughout the month. For example, every month I have a flash sale on one pre-written “done for you” health article. I prioritize my newsletter subscribers over my blog and social media followers because I only invite them to vote for the flash sale for the following month. I no longer advertise my monthly flash sales on social media. I also send my subscribers a few reminder emails near the end of the month to grab that month’s article before it goes back to full price so they don’t miss out. In addition to a few extra emails at the end of each month, I also have a monthly promotion of another one of my products or services near the middle of each month. I send a few emails to my list to give them priority notice to grab them first. The newsletter should boost your trust factor with your subscribers by giving them more value than anyone else. Plus, you can also give them advance notice on promotions and new products/services. And, don’t forget, use it to build community – make sure you invite them to reply, and make sure you respond too! While social media may be the first way people get to know you, it’s really the final part of your content marketing strategy. Once you have a blog post published and a newsletter to go out to your subscribers, you can use social media to be more visible and have more people find you. This means you need to share your blog posts with your followers many times on social media (please, please, don’t stop at one!). Use catchy headlines, quotes, images, and excerpts. Make things interesting and get people’s attention (no clickbait required). The purpose here is to stand out and pique people’s interest so they want to pop over to your blog and check you out (and maybe sign up as an email subscriber too). It also means that you should share your blog posts in other social media circles (when appropriate). Not to mention sharing other people’s great posts too. First, I use social media post creation/scheduling software called Missinglettr. This means that I create and schedule each blog post to go out on Twitter and FB nine times throughout the year (assuming the post is “evergreen” and the content is going to be relevant a year from now – as most blog posts should). Unique social media posts are scheduled three times in the first week after publication. Then two more times later that month. Then every other month until the end of the year. You can also use other social media schedulers too. Yolanda McAdam, Social Media Strategist from Suite 532, spilled the beans on her top three social media schedulers here. When it comes to social media posts, I prefer to “set it and forget it.” You don’t need to manually share your blog posts all the time. But, as always, be sure to reply to comments on your posts and engage when people reach out. The “social” part of social media means inviting others to be part of the conversation as well. When it comes to sharing with other audiences, join FB and LinkedIn groups where your ideal clients hang out. Don’t be self-serving and overly promotional. If there is a weekly promo thread, use that. Again, don’t just drop your link and run – check out others’ posts, add value, and be part of the conversation. 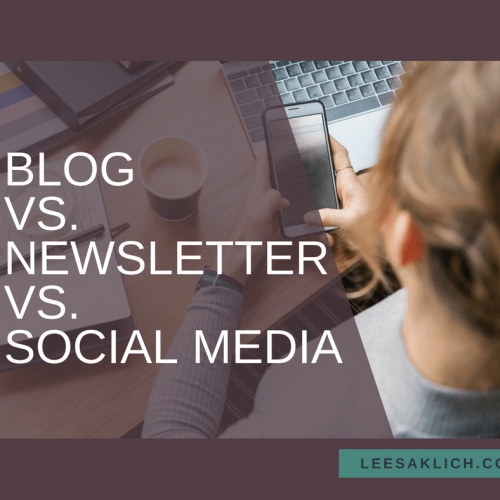 Of course, just as your blog post is not the only thing you share in your newsletter, your blog post is not the only thing you share on social media either! It’s the foundation, but not the whole strategy. Ask your followers questions, get involved in groups, share other people’s awesome content too! 1 – Blog = Boosts your “like” factor = It’s the “home” for your intellectual property. It’s what encourages people to join your newsletter. Share your blog content in your newsletter and social media channels. 2 – Newsletter = Boosts your “trust” factor = Use it to build community. Make your blog posts more personal, and give special subscriber-only benefits. 3 – Social media = Boosts your “know” factor = Get more people to find you by sharing the headline, image, and excerpts of your blog posts so they go to your blog and sign up for your newsletter. Share other people’s stuff too. What’s your overall content marketing strategy? Do you use your blog as a foundation for your newsletter and social media? What would you add to this post?